The Unesco-listed Pantanal region of Brazil is a watery wilderness – perhaps not the first thing that springs to mind when one is thinking of a holiday to Brazil. Indeed, the proper wilderness areas are really only accessible by light aircraft…the sort of thing we like at Theobald Barber. The Pantanal is a vast area located on the western side of Brazil reaching into Bolivia and Paraguay. 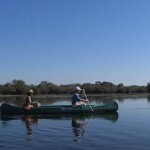 These wetlands are flooded each year by the Paraguay River system and are packed with unusual wildlife species including well over 650 species of birds, wild mammals including the elusive jaguar, and countless reptiles and plants. If you think that “safari” has got too posh these days and if you don’t need constant game-viewing, then pack your bags and head for an old fazenda (farm) owned by the Rondon family. 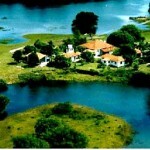 They are passionate about preserving their eco systems of which there are twelve in the Pantanal. On my visit there last year they set out with gentle pride to show me what a hidden treasure their world is. I walked, rode and, with no danger of being eaten, paddled across waterways bedecked with lilies, watching in awe as blue hyacinth macaws flashed past. It is difficult to put one’s finger on it but this wilderness definitely has a very special quality about it, not least, perhaps, because it has survived the land grabs, deforestation and population expansion which have occurred elsewhere. The endangered jaguar is on everyone’s wish-list at the dinner table. Ask me to tell you where you can see Africa’s equivalent, the leopard, and I can pretty easily oblige, but the jaguar remains the stuff of dreams…well, maybe materializing as a paw mark if you’re very lucky. 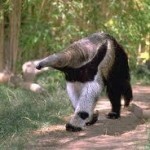 But I did see my first giant anteater, a most curious beast only to be encountered at night, and that was a wow. And there are cappuccino and howler monkeys, giant river otters, pampas deer, anaconda, capybaras, caimans and tapirs to wonder at as well. One day I saw gauchos approach the fazenda to ask if they could camp overnight on their two-day journey to market with their cattle. They were short, swarthy men who thought nothing of sleeping under the stars, struck camp early the next morning, and were gone: a reminder of a bygone era. The contrast between the Pantanal and the heady delights of Rio de Janeiro could not have been more marked; I stayed at the super-stylish Santa Teresa hotel and enjoyed a breathtaking tour of the highlights of this iconic city. 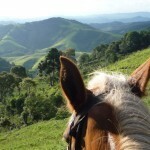 A few days of soaking up the atmosphere here – and then I was heading west along the coast to Paraty. This very picturesque colonial town has rows of cobbled streets framed by elegant houses with brightly painted shutters and creepers in reds, pinks and greens growing profusely over the walls. It looks today much as it did in the 18th century when the sheltered harbour ensured its prosperity as a route out for the gold mined inland. That is until the Indians attacked the gold carriers on the steep mountain tracks and a new route was forged via Rio which afforded more protection. 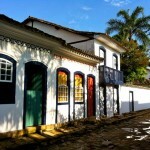 What is most striking about Paraty is that there is no mass tourism and it has a real sense of community. My host knew everyone and has two very smart properties with staff that are perfect places to stay at. 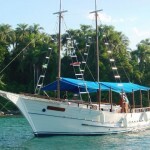 Spend lazy days out on saveiros (schooners) that will drop anchor at a moment’s notice so you can plunge into turquoise seas. Staff in snazzy uniforms serve you caipirinhas that can easily lull you asleep as you lie on one of the heavenly beaches which edge the countless islands dotted amongst tropical fjords. Return to port and a buzzing square for local atmosphere and dinner under the stars. My final stop on this journey was originally a coffee plantation. 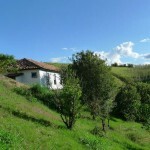 Hidden away at the end of a valley, Fazenda Catuçaba is now a gem of a retreat in rural tranquility. A welcoming lunch served in the shady courtyard was perfection itself, from the organically grown produce to the silver and 19th-century floral china on which it was served. Bento, the grandson of a former slave worker, took a small group of us up steep slopes on horse-back to admire the view of muscular valleys stretching into the distance. Early the next morning I watched the farm animals wake up, the cows being milked individually, a handsome cockerel and associated chickens and ducks – a bustling moment in the life of very small-scale farm from a bygone-era. Watery wilderness, vibrant city, quaint colonial village and hidden valleys all in ten days: sounds good to me. Do call 0207 723 5858 for further information.